Jon has been studying day and night for weeks, and I have been putting in long hours at work preparing for a fundraiser that is now behind me. For the first time in a long time, we have a commitment-free weekend. Such a luxury. I was hoping that the weather would cooperate and bring some warmer temps and a little bit of sunshine, but instead, it’s rainy and cold. To top that off, after Jon filed the taxes this morning, he came downstairs grumpy and said he needed a pick me up. Our luxurious weekend was off to a rough start. 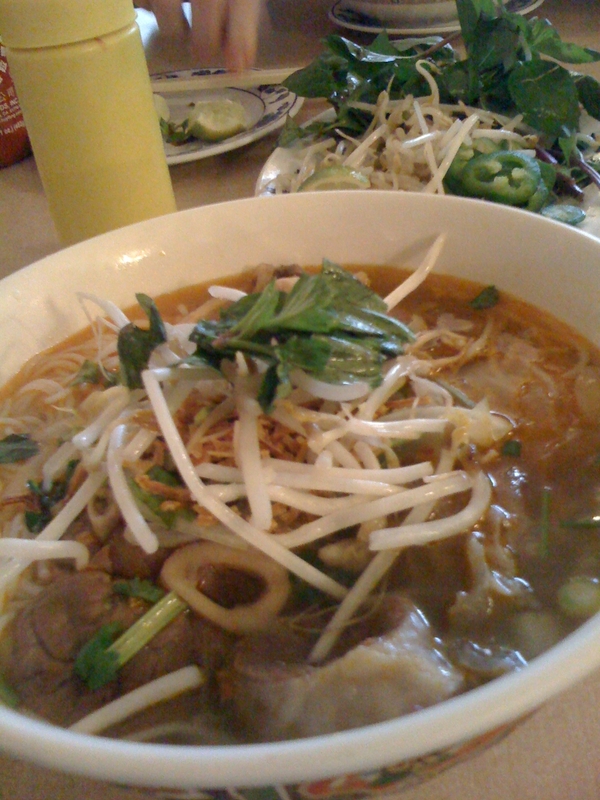 To combat the gloomy day, we could think of nothing better than one of our favorite treats- noodle bowl from Saigon. I usually order Noodle Bowl #5 and Jon orders #2- please don’t ask me to remember the Vietnamese names- but today, we ventured out and tried two of their soups- #24 and #25. We’ve always wanted to try them, mostly because they are accompanied by a plate heaping with bean sprouts, fresh basil, lime and jalapenos. Of course, we couldn’t pass up the crab Rangoon and egg rolls, with generous amounts of Sriracha, to get us started. When the bowls arrived, they looked and smelled delicious, but when I started digging in, I was greeted by gigantic chunks of boiled pork that made my stomach turn. Jon saw it register on my face, and without batting an eye, offered to trade. He saved the day. There’s no way I would have gotten through mine (#24), but the one he ordered was delicious, despite the fact that I had to discard a plateful of meat fat. Though the soup was tasty, we agreed that we’d stick to our favorites next time. On the way home, we remembered that we needed to pick up a case of wine we had ordered at a fundraiser a few weeks ago, and that took us right by Debrands. Jon is a sucker for sweets. 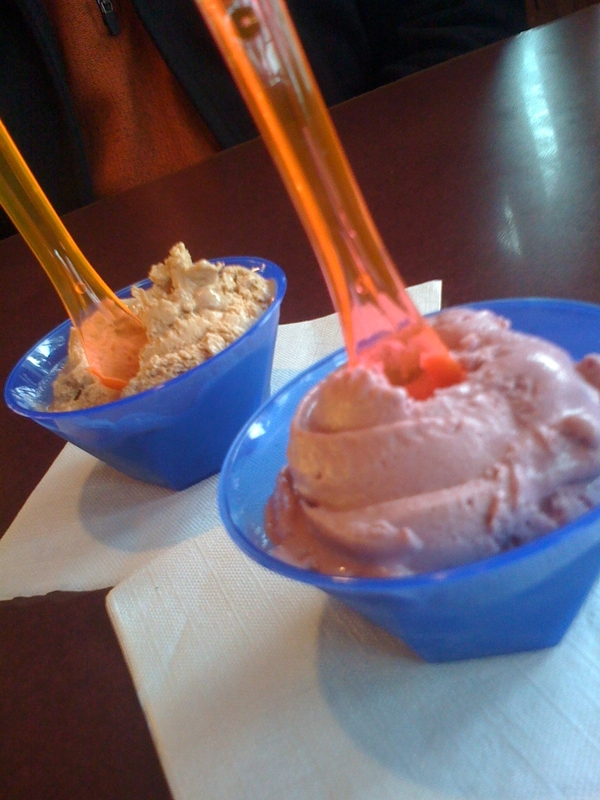 We hadn’t been in the building since it had been remodeled after the fire… and we certainly didn’t know about the Gelato! Jon ordered the Caliente and I the Boysenberry (there are 10 flavors from which to choose). Amazing. We’ve found our new favorite treat and salvaged a day that got off to a less-than-stellar start. Fort Wayne friends who haven’t tried the Noodle Bowls or Soups at Saigon or the Gelato at Debrands need to do so immediately!